It’s no secret that Android is growing at a fast clip, especially over the past year. As Millennial Media, one of the largest mobile ad networks in the U.S., reported recently Android’s mobile ad impression share went up from 6 percent in March to 2010 to 54 percent of ad impression share in June 2011, eclipsing iOS. July’s report shows similar growth patterns, with In July, Android showed particularly strong growth, with its mobile ad impression share by OS increasing by 15 percent in the month, taking 61 percent of the impressions on Millennial’s network. This is the eighth straight month Android has topped iOS. iOS share actually dropped on Millennial’s network in July, taking 21 percent of mobile ad impressions, down from 26 percent in June. RIM trailed with 14 percent of share in July, down one percentage point from June. Globally, iOS and RIM impressions were relatively flat month-over-month, but Android impressions grew 31 percent month-over-month. Symbian impressions grew 11 percent in July, but Windows Phone 7 impressions grew a whopping 71 percent month-over-month. Millennial reports that smartphone mobile ad impression share grew 5 percent month-over-month and continued to top the device list with 68 percent of the impressions in July. Connected Devices (i.e. 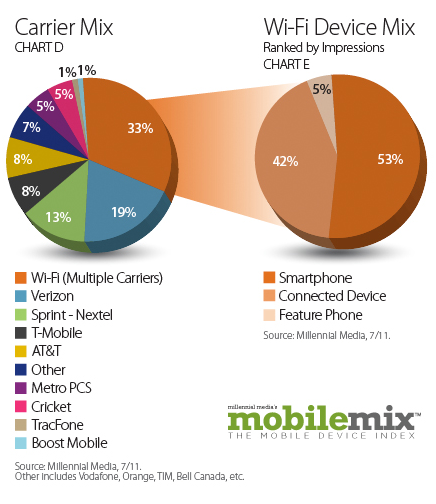 iPads) and Feature Phones were tied with 16 percent of impressions. 42 percent of the Wi-Fi impressions in July. As reported in the company’s SMART report a few weeks ago, manufacturers Apple, HTC, and Huawei all more than doubled their impression share in the past two years thanks to the growing popularity of smartphones. Millennial says that in 2009, its first Top 20 Mobile Phones list featured a mix of feature phones and smartphones, including seven BREW devices, three Java devices, two BlackBerry and Windows Mobile devices, the iPhone, and one Google Android device. 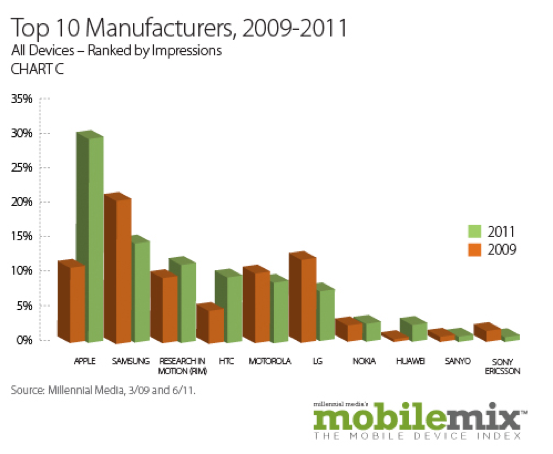 In Q2 2011, the same list consisted entirely of Smartphones (with many more Android phones). In July, Apple continued to be the leading device manufacturer the network, representing 26 percent of the Top 15 Manufacturers impression share, and the iPhone maintained the number one position on the Top 20 Mobile Phones ranking with 13 percent of the impression share. Samsung actually so the most growth month over month, up 28 percent from June, taking the number two manufacturer spot for the sixth consecutive month. 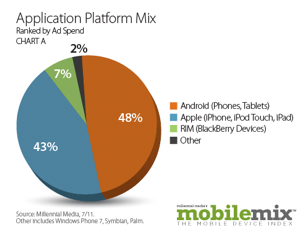 Millennial also breaks down ad spend from applications on the network, and Android passed iOS for ad spend. According to the report, 48 percent came from Android apps, while 43 percent of ad spend came from iOS apps. By genre of app, gaming apps made up 29 percent of app impressions the network, and increased 35 percent month-over-month. Another category that saw large growth was Health and Fitness app, whose impressions grew 13 percent month-over-month (calorie counting and recipe apps made up two thirds of this category).